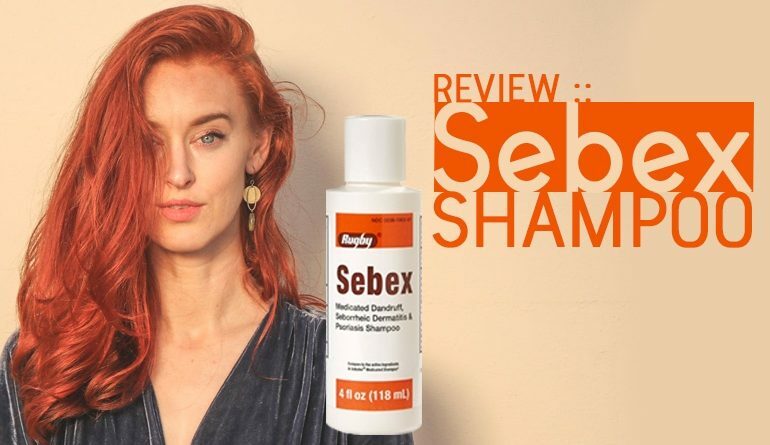 Sebex medicated dandruff, seborrheic dermatitis and psoriasis shampoo is telling us it’s fit for the job of any itchy, embarrassing, dry scalp flaking condition. With a high concentration of 2 active ingredients – salicylic acid and colloidal sulfur – more about what colloidal means soon – the Sebex formula looks set to work. Sebex sounds familiar. Is it the same as Sebulex? 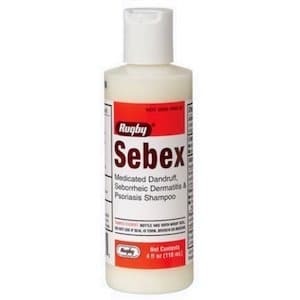 Sebex is an interesting brand – not for product innovation but because Sebex at first glance looks to be associated with another anti-dandruff shampoo called Sebulex. 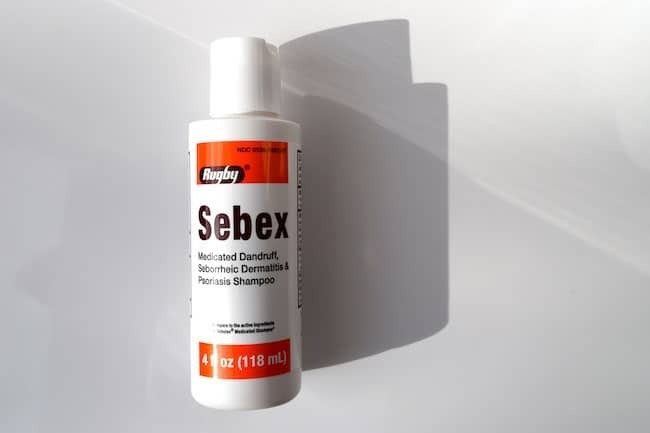 In fact, their naming is so similar on Sebex’s back label they declare Rugby Laboratories – the makers of Sebex shampoo are in no way affiliated with the owner of the trademark Sebulex. Whether Sebulex or Sebex came first is anyone’s guess. But they have the same active ingredients and more similar brand naming. This is more than a coincidence and is similar to store brand breakfast cereals looking exactly like the design of well-known about more expensive alternatives. One is capitalizing off of the others success while also keeping prices down. Rugby Laboratories are based in the USA close to the Canadian border. It’s so close to the border than Rugby have actually located their manufacturing facilities directly in Canada. Rugby Laboratories are makers of 100s of pharmaceutical products – from anti-dandruff shampoo to nicotine patches to antimalarials and laxatives. With 40 years of experience in the industry – Rugby Laboratories offer cheaper generics to pricier alternatives. They’re not dandruff experts but they sure are copying those who are. Now onto the Sebex medicated dandruff shampoo itself. When ordering a bottle – what should you expect to arrive? Sebex shampoo comes in a pettily sized 4oz/118ml bottle with flip top cap. The mono orange/brown branding gives the impression of a medicated treatment shampoo. And indeed, according to the FDA, it is a drug i.e. both sulfur and salicylic acid in these concentrations are considered drug products for the control of dandruff, seborrheic dermatitis, and psoriasis. 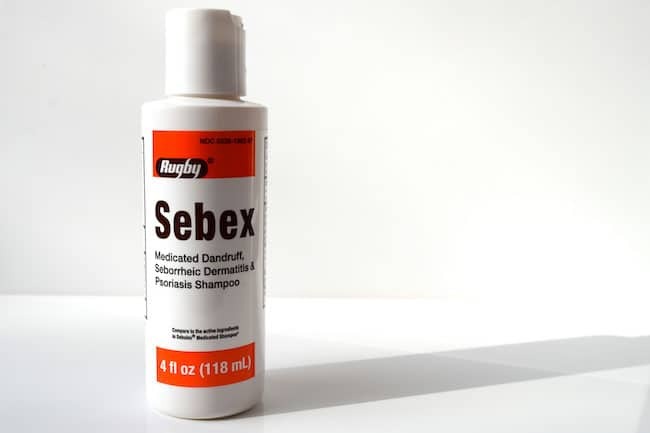 What should you expect when using Sebex medicated dandruff, seborrheic dermatitis and psoriasis shampoo? A firm squeeze of the Sebex bottle gives life to a creamy opaque liquid with a delicate scent not dissimilar to baby products. The shampoo lathers into a small bubble foam which needs a little more massaging around than normal. I had to use a few smaller doses to make sure all areas of your scalp are treated. Once you’re done, wash out is quick and normal leaving only a slight scent behind. This shampoo is also not stripping and does not leave hair or scalp dry. Note: Sulfur has a strong and distinct smell – Sebex medicated dandruff, seborrheic dermatitis and psoriasis shampoo does not smell necessarily of sulfur and the left behind scent is only somewhat sulfur like. Now the important bit; does Sebex medicated shampoo work? Sulfur is active in the control of dandruff when used in a concentration of 2 to 5%. The very same monograph also states salicylic acid may be used in combination with sulfur for the control of dandruff. Note: Colloidal is a science word used to explain when a solid ingredient is ground into an extremely fine powder. 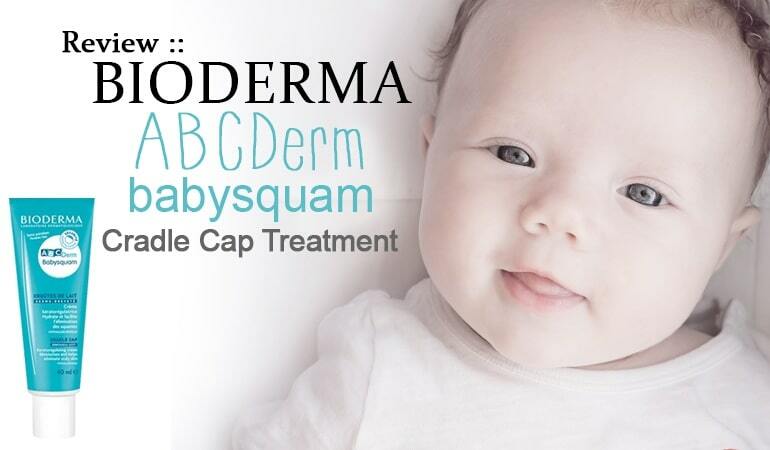 When an ingredient is colloidal in general it can be absorbed more easily by skin, therefore, making it more active. A shampoo containing 2% salicylic acid plus 2% sulfur used twice a week for 5 weeks can significantly help reduce skin scaling and that the benefits are much greater than either active used alone. Salicylic acid can enhance the effectiveness of other anti-dandruff actives by solubilizing the glue which holds dead skin cells together, therefore, improving drug penetration. 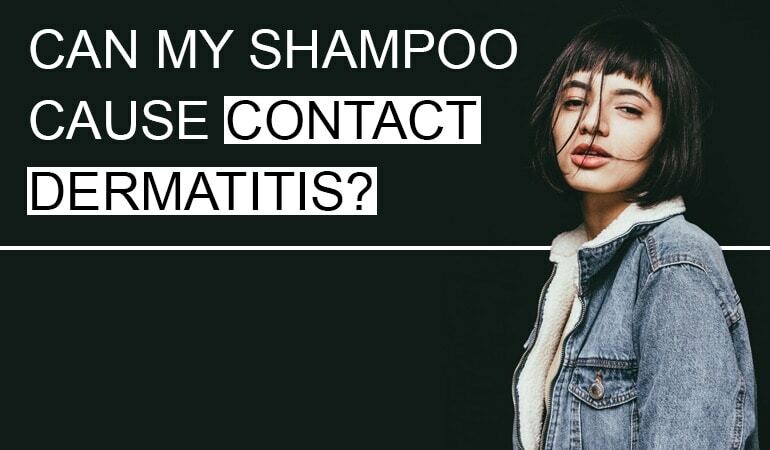 When salicylic acid is combined with other anti-dandruff actives it can significantly help reduce itching than when the shampoo does not contain salicylic acid. There is significant medically proven support that the actives used in Sebex shampoo can work for you. Are there any other helpful anti-dandruff, anti-seborrheic dermatitis or anti-psoriasis actives? There are 2 of note, firstly – PEG-75 lanolin – which is essentially a lanolin molecule with another molecule attached to it. This extra molecule helps the ingredient to absorb or interact with the skin. As it does this PEG-75 lanolin can help moisturize a dry and distressed scalp. Secondly, quaternium-15 is present, an ingredient often used in conditioners. 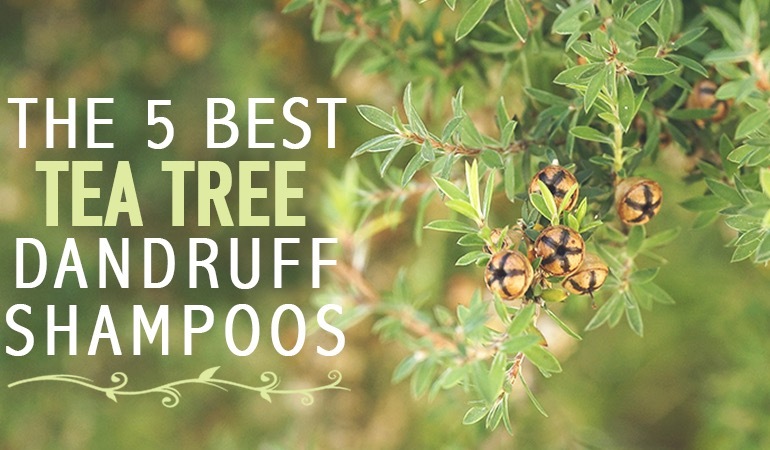 This ingredient will help your hair to be smoother and softer. Now, what about extras which might aggravate your dandruff, seb derm or psoriasis? Are there any of those? This wouldn’t be Dandruff Deconstructed if we couldn’t find ingredients that can cause contact dermatitis. Fragrance – can be irritating to skin – although there are no listed allergens as a result of Sebex using this fragrance. 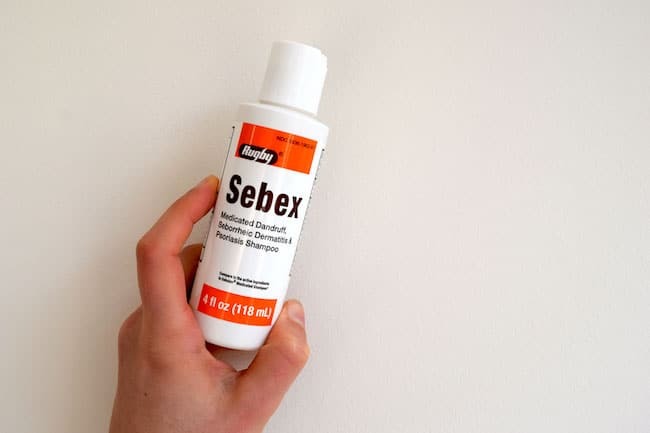 Sebex medicated dandruff, seborrheic dermatitis and psoriasis shampoo contain active ingredients in concentrations known to work – the overall formula is also somewhat milder than classic or traditional alternatives. IT’s such a shame that the company added fragrance, although the smell of sulfur isn’t exactly pleasant. And the addition of SLS is just lazy. But, in our eyes, unless you’re sensitive to harsher sulfates, this shampoo is well worth your trial.